Last Saturday the Wall Street Journal published an insightful, yet heavily controversial article about the teenage mind. In it, Alison Gopnik, Psych prof at Cal-Berkeley, attempts to explain why teenagers consistently make harmful decisions. It is vital for us as Young Life leaders to constantly be learning about teenagers. It's why I read my Twitter feed. Articles like this are helpful as we think through how we give Young Life talks, how we lead Campaigners, and how we help our teenage friends make decisions. 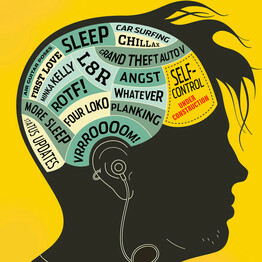 Understanding the adolescent brain also helps us when communicating with parents, most of whom share our same frustrations when their teenager makes poor choices. Gopnik's article is long, but can be read in full here. I've pulled a few paragraphs and copied them below, bolding the highlights. While I have reservations about some of Gopnik's points, it's worth the read. "What was he thinking?" It's the familiar cry of bewildered parents trying to understand why their teenagers act the way they do. How does the boy who can thoughtfully explain the reasons never to drink and drive end up in a drunken crash? Why does the girl who knows all about birth control find herself pregnant by a boy she doesn't even like? What happened to the gifted, imaginative child who excelled through high school but then dropped out of college, drifted from job to job and now lives in his parents' basement? At the same time, first with the industrial revolution and then even more dramatically with the information revolution, children have come to take on adult roles later and later. The crucial new idea is that there are two different neural and psychological systems that interact to turn children into adults. Recent studies suggest that adolescents aren't reckless because they underestimate risks, but because they overestimate rewards—or, rather, find rewards more rewarding than adults do. The reward centers of the adolescent brain are much more active than those of either children or adults. Think about the incomparable intensity of first love, the never-to-be-recaptured glory of the high-school basketball championship. What teenagers want most of all are social rewards, especially the respect of their peers. In a recent study by the developmental psychologist Laurence Steinberg at Temple University, teenagers did a simulated high-risk driving task while they were lying in an MRI brain-imaging machine. The reward system of their brains lighted up much more when they thought another teenager was watching what they did—and they took more risks. This control system depends much more on learning. It becomes increasingly effective throughout childhood and continues to develop during adolescence and adulthood, as we gain more experience. You come to make better decisions by making not-so-good decisions and then correcting them. You get to be a good planner by making plans, implementing them and seeing the results again and again. Expertise comes with experience. At the same time, contemporary children have very little experience with the kinds of tasks that they'll have to perform as grown-ups. Contemporary adolescents and pre-adolescents often don't do much of anything except go to school. This doesn't mean that adolescents are stupider than they used to be. In many ways, they are much smarter. An ever longer protected period of immaturity and dependence—a childhood that extends through college—means that young humans can learn more than ever before. There is strong evidence that IQ has increased dramatically as more children spend more time in school, and there is even some evidence that higher IQ is correlated with delayed frontal lobe development. This new explanation also illustrates two really important and often overlooked facts about the mind and brain. First, experience shapes the brain. People often think that if some ability is located in a particular part of the brain, that must mean that it's "hard-wired" and inflexible. But, in fact, the brain is so powerful precisely because it is so sensitive to experience. Fortunately, these characteristics of the brain mean that dealing with modern adolescence is not as hopeless as it might sound. Though we aren't likely to return to an agricultural life or to stop feeding our children well and sending them to school, the very flexibility of the developing brain points to solutions. Instead of simply giving adolescents more and more school experiences—those extra hours of after-school classes and homework—we could try to arrange more opportunities for apprenticeship. The good news, in short, is that we don't have to just accept the developmental patterns of adolescent brains. We can actually shape and change them.